M2L Drops analyzes the intervals of the music and displays in form of moving drops. ▪ Size - Defines the width, height, and depth of the drops. The default values are 1, 1, 1. Valid values range from 0.01 to 1000. ▪ Length - Defines how long the tail of a drop is [in %]. The default value is 10. Valid values range from 0 to 100. ▪ Length Offset - Defines if an offset is added to the tail of a drop. The default value is 0. Valid values range from 0 to 100. ▪ Pitch 1 - Defines the first distance between tubes depending on the direction [in %]. The default value is 0. Valid values range from 0 to 100. ▪ Pitch 2 - Defines the second distance between objects depending on the direction [in %]. The default value is 0. Valid values range from 0 to 100. 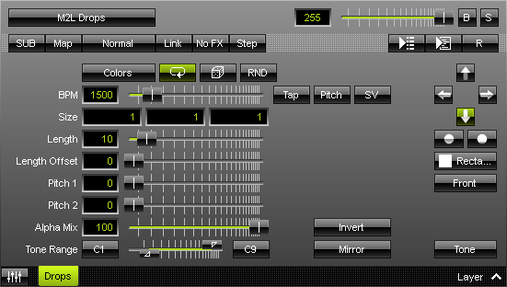 Mode - Allows you to choose which musical parameter is used [Tone, Interval, Base Type].